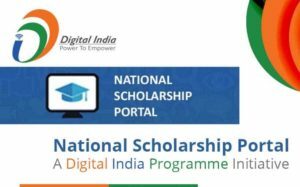 National Scholarship Portal, scholarships.gov.in: Ministry Of Electronics & Information Technology, Government of India has published notification for Scholarship Program. 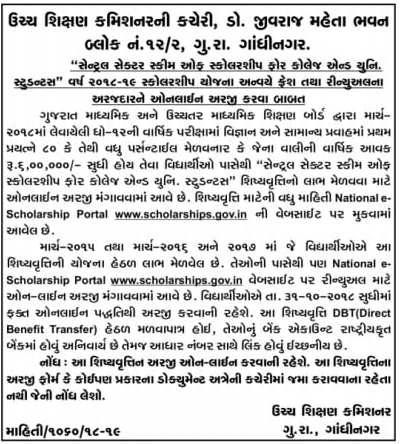 Eligible Students may apply for National Scholarship Portal on its official website scholarships.gov.in. On basis of Central Sector Scheme of Scholarship for College and Uni. Students Programme Eligible students may apply online. Boys & Girls who get 80 or above percentile in GSHEB March-2018 (Standard 12th) exam in science & arts stream they all are eligible for apply. Students parents annual income should not more than 6,00,000/- or above, they all are get Rs. 10,000/- Scholarship from Central Government standardization policy. Students who want to benefit from this scholarship they may apply online from official website scholarships.gov.in. National Scholarships Portal is one-stop solution through which various services starting from student application, application receipt, processing, sanction and disbursal of various scholarships to Students are enabled. This Portal is take as Mission Mode Project under National e-Governance Plan (NeGP). National Scholarships Portal is one-stop solution through which various services starting from student application, application receipt, processing, sanction and disbursal of various scholarships to Students are enabled. This initiative aims at providing a Simplified, Mission-oriented, Accountable, Responsive & Transparent ‘SMART’ System for faster & effective disposal of Scholarships applications and delivery of funds directly into beneficiaries account without any leakages. Candidates are advise to bookmarks this page and be regular touch on this page for get more latest updates about National Scholarship Portal 2017-18.